Designed in the late 30’s by Krupp as artillery for taking out the massive fortifications of the French Maginot Line, the Schwerer Gustav was a German 80 cm railway gun. In fact, it still remains the largest-caliber rifled weapon ever used in combat of mankind! To that end, the gargantuan instrument of war measured a colossal 47.3 m (155 ft) in length, 7.1 m (23 ft) in width and 11.6 m (38 ft) in height – for a total of 135,500 cubic ft of imposing volume. The hulking machine also holds the records for the heaviest mobile artillery weapon in the world (with its 1,350 tons weight) and firing the heaviest shells of any artillery gun. Considering these heavy duty credentials, the Schwerer Gustav could fire 800-mm shells of over 7.5 tons weight, via its 32.5 m (106 ft) long barrel, with a firing range of 47 km. As for the historical side of affairs, while the Schwerer Gustav was designed for the impending war with France, the German Wehrmacht offensive via Belgium, including its Blitzkrieg tactics, were enough to take the French nation out of the conventional conflict. 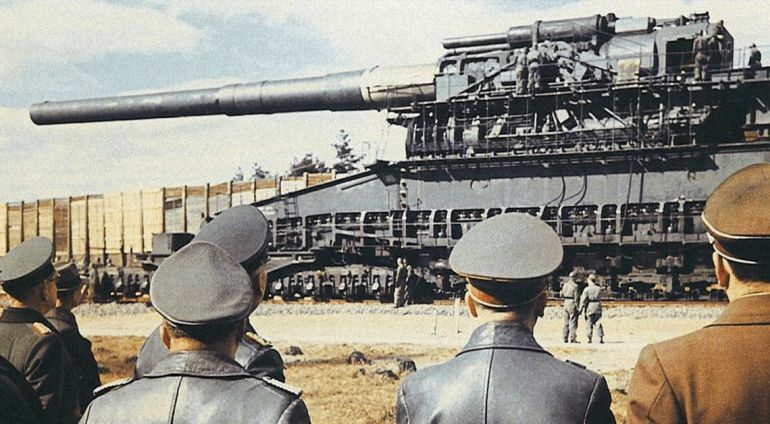 The massive railway gun was then deployed for artillery bombardment of Sevastopol, which was a part of Operation Barbarossa, a military scope that involved an astronomical 3.8 million personnel on the Axis side. During one particular incident the Schwerer Gustav was responsible for successfully taking out an ammunition warehouse that was hidden beneath layers of rock under a bay. However the humongous gun was only used sparingly during the Siege of Sevastopol, until it’s barrel was already worn out by just firing 48 shells. Later on when the strategic ambit of the Second World War was turning against them, the Germans successfully disassembled and destroyed the remnants of the super-weapon in a bid to keep it out of reach from the advancing Soviet troops. Incredible images from 1944 show Hitler in his potential disguises!